If you’re looking for a little extra security in protecting your property and loved ones, you can’t beat having a driveway gate. Driveway gates are the solution for keeping children and pets safe and contained in your garden. They provide additional security to your home as well as an enhanced sense of safety. It is a proven fact that a locked gate is a deterrent for thieves and lessens the chance of burglary. Not only does a gate enhance curb appeal adding a touch of elegance to the character of your home, but it will keep animals and other unwanted guests off the lawn. We sell and service both residential and commercial security gates and operators, as well as fences in either wrought iron, wood or chain link. Bad weather conditions are never an issue. We make sure each gate is equipped with remote control openers for your convenience. We install our products with state-of-the-art techniques. We have a range of automatic gate openers to specifically suit any driveway gate or entrance gate with power options, enhancing your security and convenience. We provide for complete fencing requirements covered from steel strainer assemblies through to quality gates & hinges, gate automation, wires and even machinery. Quality, Appearance, Durability and Value have been and are always our sole focus. Have you considered solar options? Solar panel technology can be installed to power automatic gates, electric gates, gate motors, and more. 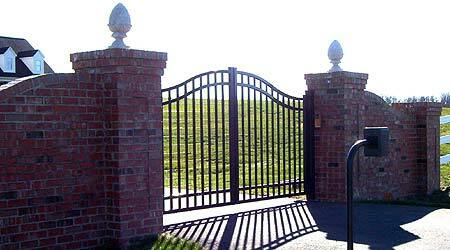 Solar powered electric gates save power. Seen as environmentally friendly and affordable, solar energy options avoid extra cables. Well maintained models consistently perform for years. Consider the hard-working farm owners out in the Texas country-side who benefit from these devices. Eliminate the stress of dealing with power outages and blackouts. 911 Garage Door Service is ready to install or upgrade your driveway gates to high efficiency solar powered systems today!